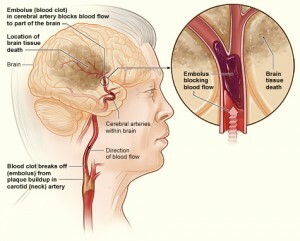 A transient ischemic attack (mini-strokeÂ or TIA) occurs when a blood clot creates a blockage for a short period of time. The duration of this episode can be a few minutes to a couple of hours. The symptoms associated with a transient ischemic attack are similar to that of a stroke and should be considered an emergency as it is a warning sign indicating underlying circulation/ blood clot issues. If left untreated, individuals who have experienced a transient ischemic attack are more than likely to have a stroke. The length of a TIA episode makes it difficult to diagnose but once you’ve relayed your symptoms to your doctor, they will carry out diagnostic tests to confirm your diagnosis and plan for treatment. Medications that might be used to treat TIAs include antiplatelets and anticoagulants (blood thinners). These powerful medications need to be administered carefully and under the guidance of a physician or healthcare provider. A TIA is often referred to as a warning or mini stroke. A TIA and ischemic stroke occur via the same mechanisms of clotting, however, the clots dissolve quickly during a transient ischemic attack (TIA). This is a warning because future ischemic strokes are very likely after a TIA seeing as the patient is suffering from abnormal clotting in the heart or elsewhere in the body. TIA’s can last anywhere from a few seconds to a few minutes. Approximately 1/3 of people experiencing a TIA will have an ischemic stroke within 1 year. 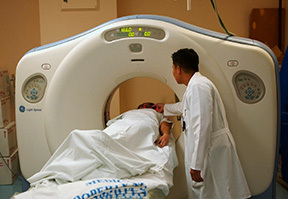 Computed tomography and magnetic resonance imaging provide detailed images of the brain. Upon review, these images may show bleeding in the brain as a result of a hemorrhage or physical damage to brain cells due to ischemia. Carotid artery angiography is a method of imaging the artery using x-ray. A patient is injected with a dye through a catheter inserted at the groin. The dye allows the carotid artery in the neck to be visible on x-ray which can allow a physician to physically see a clot. These clots are often the causes of ischemia and ischemic strokes or TIA. AtherosclerosisÂ this is a disease in which plaque builds up in the arteries. This narrowing of the arteries restricts blood supply to the brain causing the stroke. These plaques are formed by white blood cells, triglycerides and cholesterol in response to poor diet and lack of exercise. Atrial Fibrillation Atrial fibrillation is a condition in which 2 chambers of the heart, the atria, contract abnormally leading to an irregular heart rhythm. This inconsistent flow of blood through the heart can lead to clots within the heart that can also block blood flow to the brain causing a stroke. Diabetes Â can cause high blood pressure, high cholesterol and is often accompanied by obesity. Obesity can lead to blood clots from inactivity and injury.